Warning, there be spoilers ahead. Earlier last month, the forums for the videogame website selectbutton.net hosted a conversation about the one game we would champion, if we could only champion one game for the rest of our lives. While there are lot of vidcons I like, my choice was easy–not because its perfect, but because its flaws don’t stop it from being one of the most affecting pieces of fiction I’ve ever experienced. In its thirty-something year history, videogames have become rather good at telling enjoyable stories. It’s not something everyone can do, but there’s a pretty established template of things to do vs. things to avoid. And thus, we have videogames with fun stories, entertaining stories, exciting stories, and stories that make you go “hell, yeah”. I would say, however, that there are very few stories that could be considered moving–stories that get deep into your soul (assuming you believe in one) and stay with you. Before Dreamfall, I could name two, and they belonged to the same franchise. 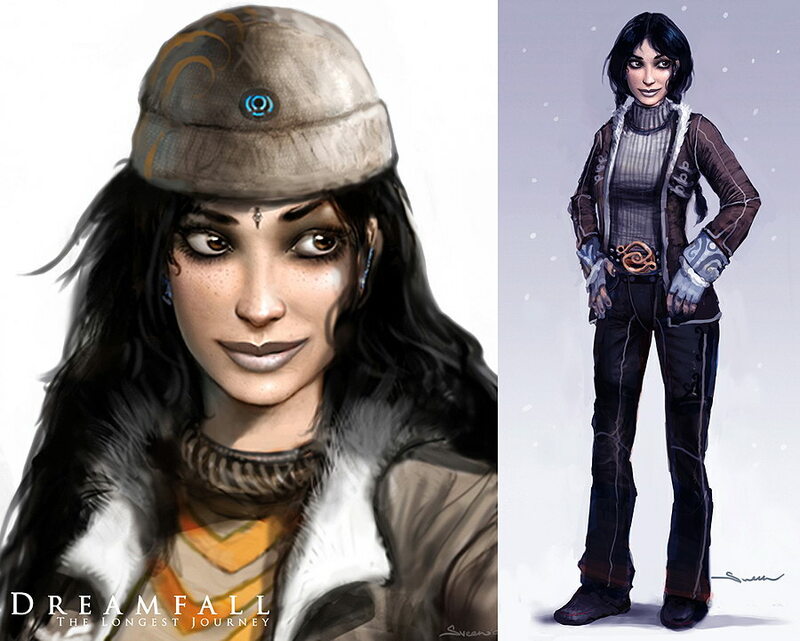 Dreamfall‘s characters feel real in a way videogame characters rarely do. Zoë Castillo is a college drop-out (major: bioengineering) living at home with her dad in Casablanca. Suffering from what to my untrained eyes seems like depression, she is joylessly going through the motions until her ex-boyfriend, a reporter for an underground newspaper, asks her for a favor shortly before going missing. It’s hard for me not to like Zoë. She’s an everyperson who actually feels like an everyperson, thanks to the heavy dose of context we get before the plot begins proper. Zoë, we learn in the first few scenes, has friends–friends who worry about her when she doesn’t show up for her own party, and which include Olivia DeMarco, a techno-wizard and shop owner who has created a program to make people–or rather their cell phones–invisible to the Eye in the Sky. She’s the Lucca to Zoë’s Crono, with the added benefit that Zoë is not mute, so the friendship doesn’t feel like something to be taken on faith, which is something that I can’t really say for a lot of friendships in videogames stories. Also, I really appreciate that she can continue to be friends with her ex, in a way that feels genuine and not set up for an inevitable reunion. On that note, no, they don’t get back together. There’s never even a suggestion that that’s a possibility. How refreshing is that? It’s also refreshing to see a game where being strong doesn’t necessarily correlate with being powerful. While we learn early on that Zoë takes self-defense classes–in a scene that serves to both explain the game’s combat mechanics and to further highlight Zoë’s malaise–we eventually find out that it serves little practical use in real-life situations. While it’s theoretically possible to defeat the handful of enemies she fights, it is by far the least practical solution. Zoë’s main assets aren’t her brawn or even her skill set, but the fact that she decides to see the situation through, even as she quickly finds herself in over her head. She’s a hero, even when she has no reason to be. Eventually, Zoë’s search for answers brings up the name April Ryan, a young woman who had gone missing years ago. April served as the protagonist for the original The Longest Journey, and her own journey is continued here, as she finds herself struggling to live her life after she’s already fulfilled what she believed was her destiny. She’s going through the motions in her own way, as she leads a group of rebels fighting against the Azadi empire, who have taken over the city-state of Marcuria–more on that in a minute. Like Zoë’s, April’s story started with her being an everyperson who was thrust into exceptional circumstances. However, while they share a same basic template, they are distinctly distinct characters. April is–or was–snarky and vivacious; Zoë is more contemplative and melancholy. You can also tell that their situations were reversed, they would have likely ended up in different places. Ten years have passed since April’s initial bout with weirdness, however, and she has now had time to become more accustomed to both it and the pressure her history brings, and her time as a freedom fighter has left her more hardened, cynical, and inflexible. And while in another time she and Zoë may have become friends, that time is not now: April has other things to worry about, and playing big sister is not one of them. Her own journey is tragic in every sense of the word. One of the things I really love about Timothy Zhan’s Star Wars books is the way he took the Galactic Empire, which had only ever been dealt with in broad strokes in the actual movies, and turned it into a place populated by actual people–people who sometimes didn’t see any difference between one government and the other, or who sometimes looked at oppression and decided “I can live with that”, but people nevertheless. The occupied Marcuria is a lot like the Marcuria seen in the original game–sure, there’s Azadi soldiers and steam-powered machines of unknown purpose everywhere, magic users have been forced into a ghetto, and public shows of reverence to any gods but the Azadi’s own Goddess are verboten, but as occupiers go, they’re a lot better than the Tyren they defeated between games, and none of these changes have been enough to prevent conformism for setting in for a lot of people. And to drive the point home, we have an Azadi apostle called Kian Alvane as our third protagonist. He’s tasked with killing April, and his only major flaw appears to be a heaping helping of privilege that prevents him from seeing the darker side of the people he has pledged his life and faith to. As must happen in these narratives, they eventually meet, and, in a scene that makes me glad that this is a videogame and not a novel, you get to control both sides of the conversation. The original The Longest Journey was a more-or-less traditional adventure story–April becomes involved in a set of extraordinary circumstances, which unleash her capacity to be heroic, which in turn allows her to save the world. Dreamfall is not so idealistic. Not only do we find that April’s adventures have taken a toll on her, the crises faced here are not as easily solved as those ten years ago. Empires and megacorps and tech ghosts are more than any one single person can usually handle on their own, and the game reflects that. It feels more grown up that The Longest Journey, and no scene better exemplifies that than Zoë’s interlude in Newport, the fictional college town where The Longest Journey began, which we find has been ravaged by the catastrophe that has occurred between games. April’s friends are still around, but they’ve had to adapt–some have left and are doing their own, some have found following their dreams less important than putting food on the table, and others have fallen in with a bad crowd. Which isn’t to say it’s all grim darkness. Dreamfall does humor, and it does it well; if I were confident that I had any idea what I was talking about, I’d call it Pratchettesque. Some of it may be insensitive–there’s a joke about how in their attempts to make their line of robot companions more humans, a toy company had created a robot monkey with ADHD–but these are isolated. Also, props must again be given for the way the game develops the relationships between characters, which are a big factor that prevents the game from getting dreary. 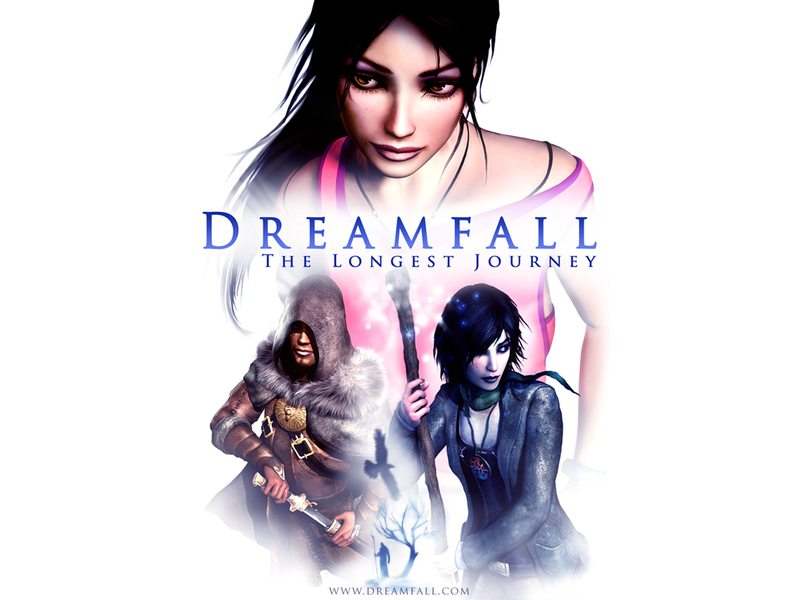 Through this review you might have noticed that it’s kinda impossible to talk about Dreamfall without talking about The Longest Journey, which may raise suspicions about one’s ability to enjoy the latter without having played the original. As somebody who ended up playing Dreamfall first, I would have to say that this is not necessarily the case. Yes, there are a ton of references to the original–about one third of the cast was present in the original, locations are revisited, and certain scenes lose significance if you don’t have the context. And yet, I feel the game works just as well or better without the context, at least when you’re playing as Zoë; it’s much easier to get behind the character when the things that she doesn’t know are also things the player doesn’t know. On the other hand, playing as April without playing the original game sometimes feels like eavesdropping on an inside joke. In the end, while I recommend playing both games, what order one does so isn’t terribly important–both approaches have benefits. 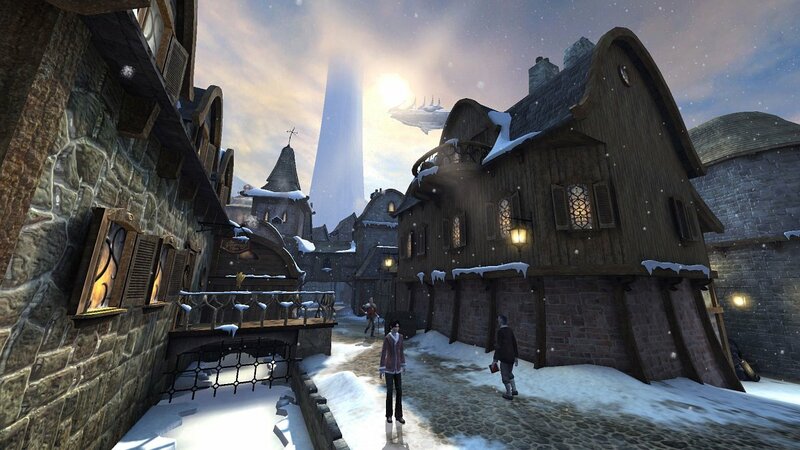 Of all my favorite videogames, Dreamfall might possibly be the most flawed. While playing it, I keep wishing that Tørnquist had teamed up with Michael Ancel to adapt Beyond Good and Evil‘s engine to create something that played as good as it felt. 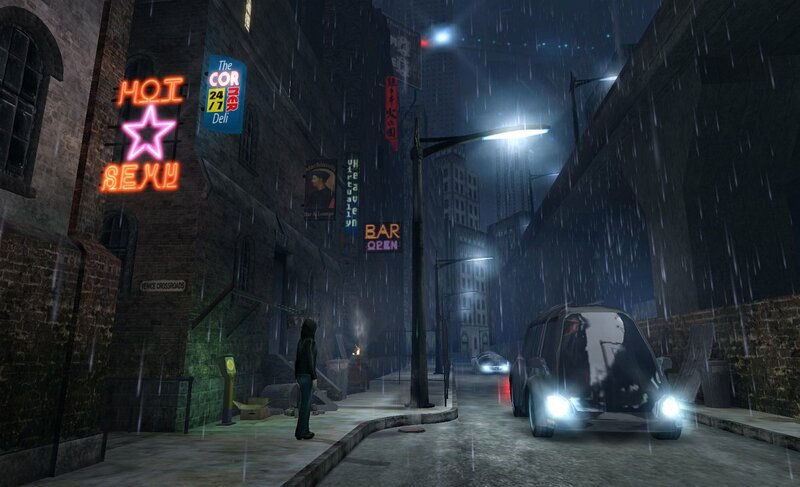 Still, I feel that Dreamfall is worth emulating. I want more videogames with genuine human warmth. I want more games where it actually feels like women make up fifty percent of the population, and being a minority doesn’t mean that one is a monolith. I want more games where darkness, violence, pain, and ugliness can coexist with light, kindness, laughter, and beauty. When games that can marry those things to superlative gameplay exist, I’ll be able to say that videogames have matured: until that happens, though, I’ll keep revisiting Zoë, April, and Kian and enjoying the hell out of the experience. It’s not a bad way to spend twenty hours. * At least, that’s the way I see things–Zoë’s skin color, I’ve recently found, is not universally agreed upon. TV Tropes, at least, appears to consider her to have “ivory skin”, which I don’t see at all–to me, she’s ambiguously brown**, and given her concept artwork, I believe that’s how the creators view her as well. ** For a certain value of ambiguity, anyway. The context suggests that her father has Spanish origins, and her mother is unknown (although we get heavy hints as to her identity). We also don’t know if they’ve always lived in Morocco–which is certainly possible–or if Zoë was born somewhere else. *** Fake edit: Apparently there’s backstory that explains it. Never mind. Hey, I found this post when I was searching for Dreamfall meta. Hope you don’t mind comments from complete strangers. I hadn’t really thought about it until I read this, but I completely agree that Zoë and Reza not getting back together is incredibly refreshing. Especially because one of my least favorite tropes is when the supporting cast of a story starts insisting the two main characters should get together. 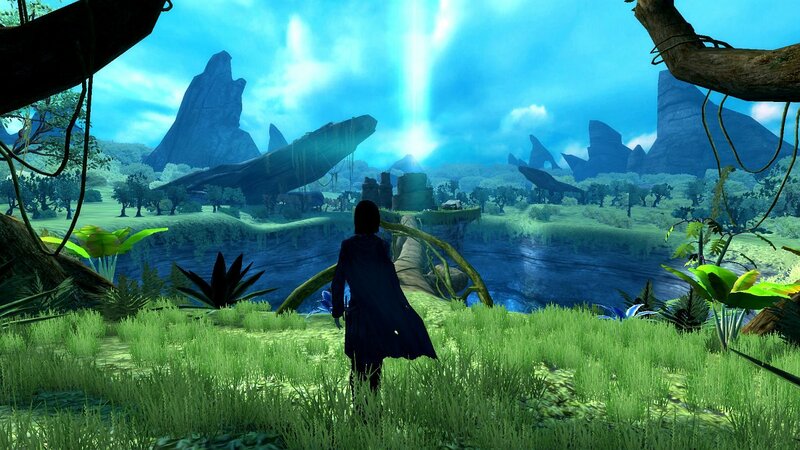 There are examples of this trope in both The Longest Journey and Dreamfall. Fiona and Emma both hint that Charlie is in love with April and assume she hasn’t figured it out and Karen (Zoë’s barista) says she can tell Zoë still has a thing for Reza. In most stories this would be set up for the inevitable get together, but in The Longest Journey April not only doesn’t get together with Charlie it also turns out she already knew Charlie had a crush on her, she just didn’t want to deal with it because she didn’t feel the same way, and in Dreamfall Karen turns out to be wrong, as proven by Zoë starts a relationship with another guy. I think the reason I’m so fond of this subversion is because it shows that April and Zoë know their own desires better than the people around them. Unlike some other stories where the unfortunate implication seems to be that everyone else knows a woman’s wishes better than she does herself. Other then that I just wanted to express my appreciation of how well written and fair this review is. I’ve found that a lot of reviews of Dreamfall is plagued with TLJ nostalgia and basically dismiss Dreamfall for not being a traditional adventure game, but you were able to talk about both the good and the bad without ever criticizing Dreamfall for being something it was never trying to be. Thank you. I agree with you about finding such insistence annoying. My rule of thumb is that suggesting something once is fine, suggesting twice–especially if one knows that the person one made the suggestion has acknowledged and considered it—is flirting with rudeness, if not worse, and that insisting is right out. I don’t quite remember the examples you mention or where they’d fall on my scale–it’s been a while since I’ve played either game—but now that you’ve mentioned it, it’s definitively something I’ll have to keep an eye on. Oh! Hello again, themaskedgeekgirl! Thanks a lot for the heads-up; I’m don’t really follow the news surrounding The Longest Journey all that closely, so I probably would never have become aware of this if you hadn’t told me about it. Here’s hoping it succeeds!